Due to missed communications, David's web site was accidentally removed from the server he was using. And somebody now has his old domain name, PerformanceFlyRods.com. I'm hoping with word of mouth, people will be able to find this new site, DaveLewisFlyrods.com. I know he had a lot of fans who enjoyed his writing and photographs. I know David corresponded with many of you about rod building and fishing. If any of you have correspondence or contributions he made to the various fishing forums that you think would be a good addition to this site, please share them with me. Mary Lu and I make up what we like to refer to as a "Small Rod Company." 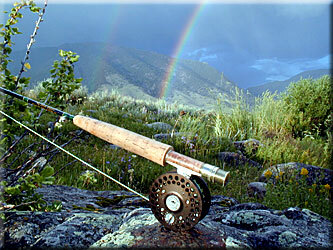 We are Performance Fly Rods, just the two of us. When you call Performance Fly Rods you will be talking with us. This site hopes to bring you to us. Below are the links that will take you to its various parts. Please take the time to enjoy our work. Photo Journals: a page listing all the fine quality photo journals I've done featuring the many places I visit in my continuous pursuit of the wild trout. Again a very popular site feature. The Small Rod Company: who we are and what we do. Prices: our complete list of rod models and their prices. Blanks: an explanation of the rod blanks we use and what to expect from the rods built from them. Grips: the grips we typically use in our rods, how we do them and what they look like. Pictures: a page filled with very high quality photos of our rods and us. More Pictures: a second picture page featuring many of the fine components we use in our rods. Special Rods for Special Folks: is page of pictures of some of the special order rods I've built this year along with some commentary on my customers' wants and wishes. Featured Rods: a page of links to five pages featuring pictures and descriptions of my various rod lines. If you want to know what my work is really like be sure and visit these pages. Show Schedule: a complete schedule of the fly shows we exhibit our rods at for this year. Fish Tale Note Cards: a page devoted to pictures of Mary Lu's beautiful pen and ink note cards. Fine Rods in Fine Places : a pictures page featuring my rods in the fishing settings I use them in. Probably the most popular section on the site. Customer Feedback: a large page with over fifty notes, letters, photos, sketches and the like from my many satisfied customers. If you wonder about the quality of my rods, visit this page and see what my customers say about them. Customer Feedback 2007: building on the popularity of my original feedback page, link above, I've continued with a second page with even more and bigger pictures and lots of folks' wonderful experiences. Site Comments: is a companion page to my Customer Feedback page. It contains a long list of unsolicited emails I have received over the years in praise or criticism of my web site. Closeouts: a listing of inventory items that I am willing to sell at sacrifice prices. Warranty: an explanation of my warranty policy. Take a look at my new Spar Varnish wrap finish page. Don't forget to check out my: Wild Trout Fishing Images $30 matted and framed, $20 matted. You'll like my upscale Glass Rods with nickel silver fittings. Don't miss my new Special Rods for Special Folks page and the 2008 version, along with page two of it. I'm sure you'll enjoy six new entries on my Photo Journals page. For all of my 2008 rod models, see the Prices page. And check out my updated Closeouts page, for some great deals.